For many of us, the holidays are a time of connection, reflection and giving. In our modern society it seems the most meaningful parts of the season can be lost in the shuffle of wrapping paper, stress, and long lines at the mall. This is especially true for persons with Alzheimer's who live on the edge of isolation every day. 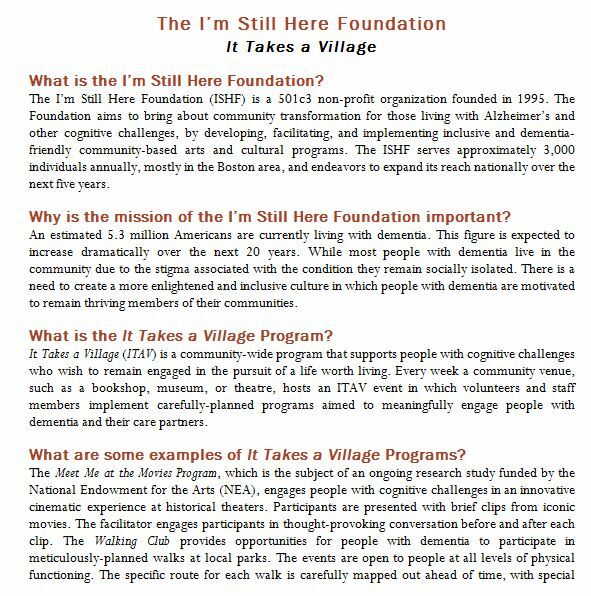 It Takes a Village, a program of the I'm Still Here Foundation, growing from our ARTZ program, is a Dementia Support Program for those affected by memory challenges. We enable our guests to experience art, music, culture, and social activities each week. Our program participants truly live through their disease as the program re-engages the loving, intelligent and active persons who are "still there". Because the programs are provided the same day and time every week, participants learn to expect the program and after only ask, "It's Thursday, where are we going today?" Through procedural learning, people living with dementia can continue to learn through the journey of dementia and ITAV helps them do this. In the past, we have provided this dynamic programming at the rate of one or more programs per week at no cost to our participants, but now we are struggling as the program grows in response to the need to continue to offer these programs at no cost. 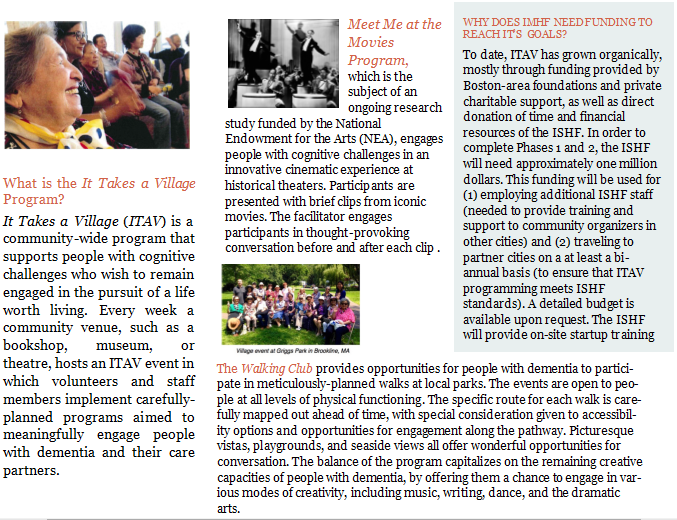 We therefore are reaching out, in our first ever fundraising letter, to ask for your help to increase our presence in your communities, network with more organizations, and work with more individuals living with dementia. Please click here or on the link below if you are able and willing to make a donation. 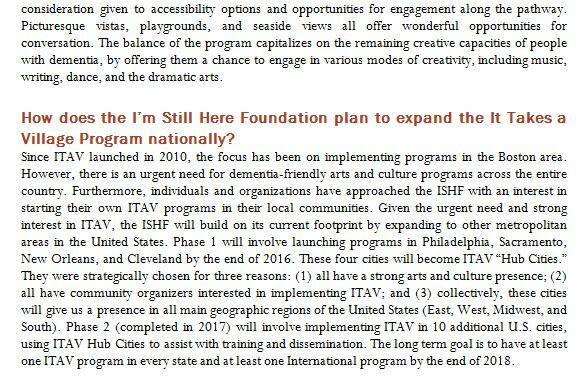 Your donation is very important to us and we can assure you that we keep our program costs at a minimum and that these funds will create more opportunities for those who live in our communities and wish you to know that they are "still here".